Reality training in a martial arts school is not as simple as it may sound. 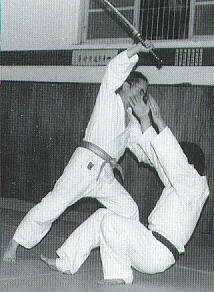 Quite often, uke and nage over-cooperate with one another in self-defense drills to the detriment of learning proper function and technique. Donn Draeger recalled one of his instuctors wacking him over the knuckles with a wooden bokken because he failed to hold his weapon properly. Aikido founder Morihei Ueshiba instructed his disciples to attack him full force with spears. These days, students wear head gear, chest protectors, and hand guards - I'm all in favor of safety, don't get me wrong, but sometimes safety equipment can do more harm than good in preparing students for actual battle. Jiu-jitsu ground-fighting takes on a whole new meaning when it's moved from the mat to the concrete sidewalk. Training in the martial arts should be approached with passion and conviction. When training with a partner, make her/him work! Make it as real as possible. Pretending uke is a jerk or bully works wonders. Realize your bujutsu skills will be most sorely tested away from your school, your sensei, with your shoes on, and quite possibly with a loved one in your presence. Remember, how you train is how it happens. Your blog "Keeping it real" makes me more aware of how important it is to keep a serious tone to training when doing self defense exercises. It's so easy to break into a giggle especially when you end up with your elbow in your ear instead of where it should be. I'm am most guilty of such a giddy reaction. If I was really defending myself, I do not think that I'd be laughing at that point. Thank you for reminding me. Enjoyed the post. A student is only as good as the partner they train with. Pressure testing is important and should grow with the student so when they are ready for some full-on all-out training they are mentally prepared. I agree completely with the sentiment of pressure testing and non-compliant drills. With respect, though, I would suggest that the difference between rolling on a mat and on a concrete sidewalk isn't as vast as you seem to suggest. I hope you don't mind my commenting on articles written so long ago, but I am enjoying your blog. While I might disagree on some points, I appreciate the differences of opinion and the thoughtful treatment you seem to give each topic.